The Advanced Management Program for Legal Executives, a custom executive education program designed by the Association of Corporate Counsel Charlotte Chapter and UNC Charlotte Executive Education, has won an Outstanding Achievement Award for “Best Partnership Program” from the Association of Corporate Counsel. 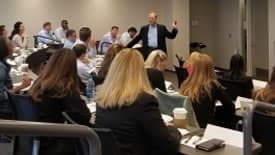 The Advanced Management Program, based on MBA coursework and taught by UNC Charlotte Belk College of Business faculty, is delivered during an academic year at UNC Charlotte Center City. There are nine sessions in three modules that cover finance and accounting, leadership and ethics and strategic marketing. The program launched in September 2017, and a second cohort began this fall. The Association of Corporate Counsel (ACC) Charlotte created the program to give in-house counsel the background and resources they need to develop a more in-depth understanding of key corporate functions. Enhanced business acumen and insight into how company stakeholders and departments work provides participants with a competitive edge—helping them to improve client communications, increase their client’s performance in the business environment and advance their careers. Members of ACC Charlotte picked up the award at this fall’s International ACC annual meeting in Austin, Texas. ACC Charlotte’s Advanced Management Program was chosen as the only winner in this category among all chapters. ACC has more than 40,000 members globally. Jack Cathey, director of the MACC Program and associate professor of accounting, was integral to the design. "The partnership between ACC Charlotte and Executive Education produced an outstanding professional development program,” he said. “Working with the Charlotte Chapter leadership we were really able to create a highly customized and very relevant program. I'm so glad the program was recognized at the national level and look forward to continuing to work with ACC Charlotte." UNC Charlotte Executive Education is a comprehensive professional development provider located in the heart of Uptown Charlotte. Executive Education leverages interdisciplinary faculty from across UNC Charlotte to develop and deliver world-class executive education. Jennifer Ames Stuart, director of UNC Charlotte Executive Education and clinical professor of marketing, said, "A program like the Advanced Management Program allows the greater community access to the University's cutting-edge research and faculty. I'm proud of the program and the strong partnership between these two important Charlotte-based organizations."